Fulltimers who love the life. Dan is retired from the Chicago Transit Authority as a construction/electrician. Carol is retired from the government. Have workamped all over the United States. 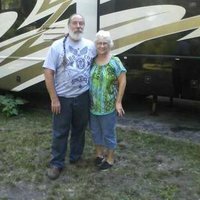 We have also worked in the RV industry off and on throughout our years on the road, Dan being a walk-thru instructor for Lazy Days RV Center in Tampa, FL and Carol working for Camping World in Tampa. We use to be vendors at motorcycle rallies all over the United States and enjoy riding our motorcycle, reading and relaxing and enjoying our friends all over the United States. Travel all over and have found some beautiful spots. 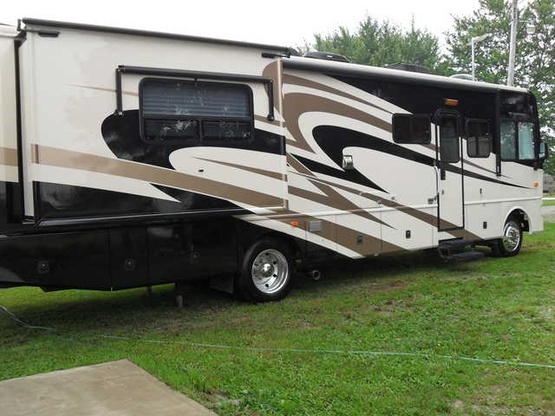 Parked in Villa Park, IL in driveway of Michael & Annie Overboe who offers this spot on the Boondockers site. They were awesome hosts. Also parked in Twelve Mile, IN in shop parking lot of Butch & Fonda Williams, who were very nice. Dan originally from Chicago and Carol originally from Milan, Michigan. 2007 36 foot Fleetwood Bounder with 2 slides. We sometimes tow a cargo trailer or Ford Fiesta. Getting rid of the cargo trailer and getting a flat=bed trailer to carry motorcycle and car. Very nice guests, welcome back anytime! These folks were very nice, courteous guests. Since they have been fulltimers for 13 years, we had LOTS and LOTS of questions, they were patient and had LOTS of answers for us. As the recommendation line says, They are welcome back anytime.